Book lovers on the North Coast are in for a treat this weekend as not one, but two, local writers visit Waterstones Coleraine as part of a special reading tour by Doire Press. 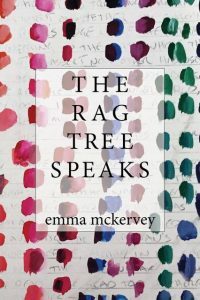 Bangor author, Kelly Creighton, and Holywood poet, Emma McKervey, will be at the store on Saturday, November 18 from 2pm, when they will each read from and discuss their new work. The event is the third stop on the seven-date tour, which also includes poets David Butler and Annemarie Ni­ Churreain, and will see the writers visit Kilkenny, Belfast, Bangor, Galway, Cork and Dublin. 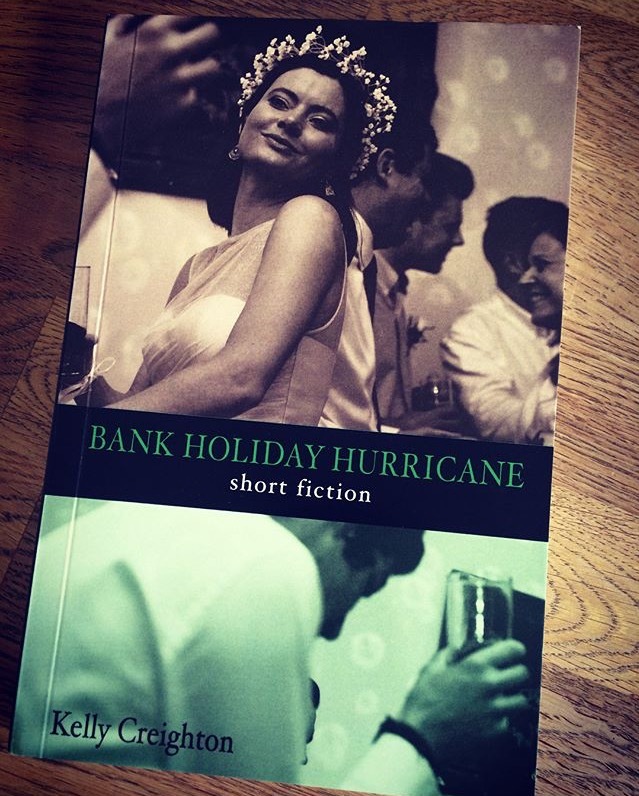 Kelly’s debut collection of short stories, Bank Holiday Hurricane, has been described by Portstewart author Bernie McGill as ‘truthful, gritty, hard-hitting stories’ which are ‘distinctive, powerful and filled, at times, with an electric high-wire tension’. 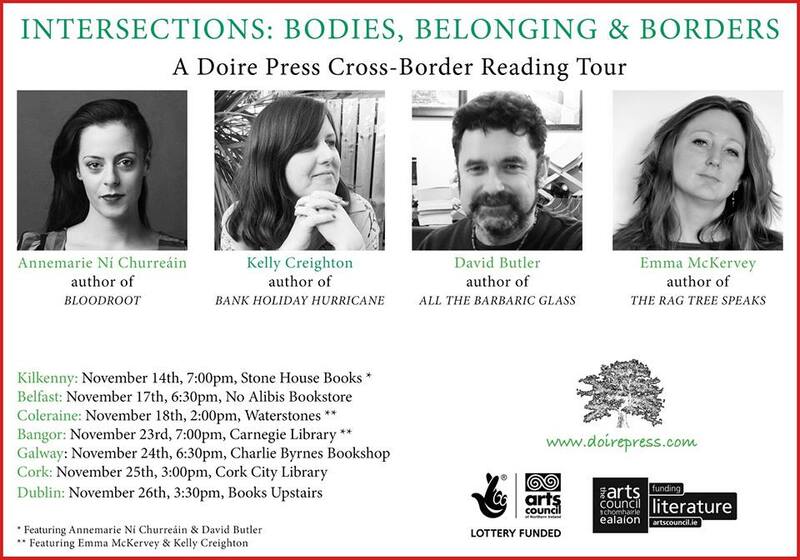 Co-funded by the Arts Council of Ireland and the Arts Council of Northern Ireland, the reading tour is officially entitled Intersections: Bodies, Borders and Belonging. Indeed, it is both cross-genre and cross-border, including a mixture of writing types, and with authors from both Northern Ireland and the Republic of Ireland represented. She added that Bank Holiday Hurricane was “largely about bodies, belonging and borders,” so fitted in perfectly with the overarching themes of the tour. 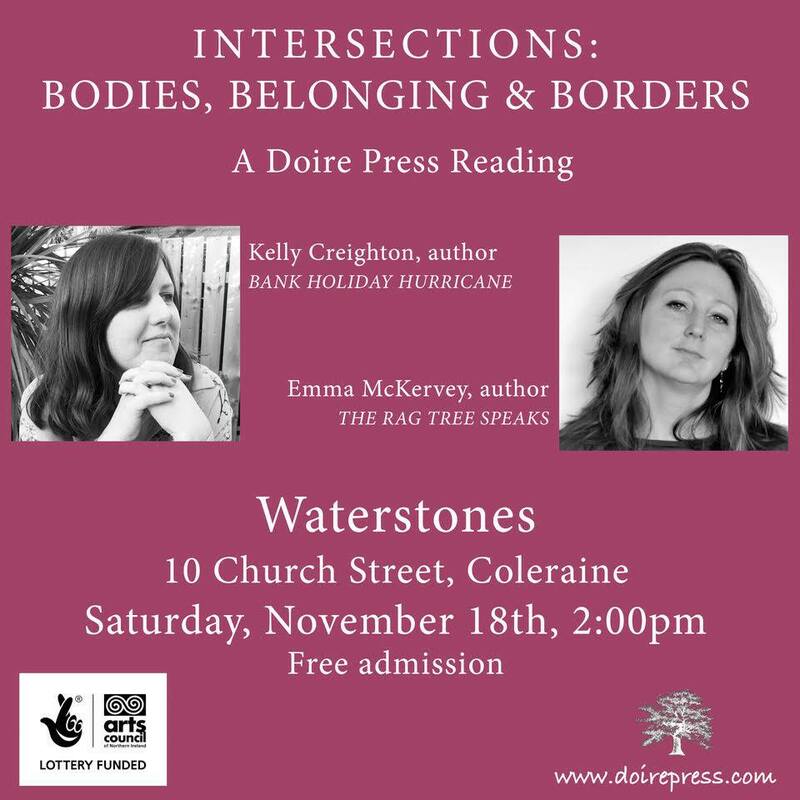 Bank Holiday Hurricane is Kelly’s second publication, with her debut novel, The Bones of It, previously published by Liberties Press. It was named the San Diego Book Review’s 2015 Book of the Year and was also nominated for the Kate O’Brien Award. With an extensive publishing history, Kelly was also a former runner-up in the Michael McLaverty Short Story Award and has been shortlisted for numerous fiction and poetry prizes. Meanwhile, her work has featured in literary journals including Litro, The Stinging Fly and Cyphers. She is also found­ing editor of The Incubator, a journal showcasing contemporary Irish short stories. A regular visitor to the North Coast over the years, Kelly has enjoyed many holidays in the area, with frequent trips made to Coleraine and indeed, to a certain bookstore. 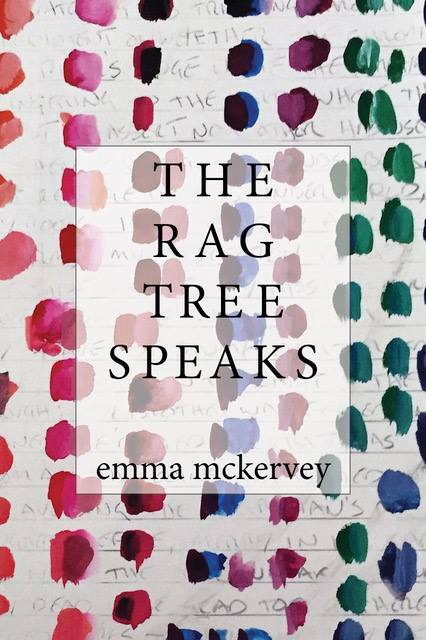 Having won the 2015 PoetryNI/Translink Poetry Competition, Emma was also shortlisted for the NI National Poetry Competition and the Bord Gais Irish Book Awards’ Poem of the Year Award in 2016. She said that a love of poetry had been with her since early childhood and that she started writing her own poems aged just seven, after her sister gave her a special hardback notebook. “I was fortunate enough to have a mother who loved Walter de la Mare and a sister who was a Spike Milligan fan,” she said. “The emotional response to having children, the combination of joy and utter tedium in raising them, and the sheer amount of time spent standing on beaches and in woods observing them explore and observing the natural world, lead to a strengthening of the inner voice of poetry which I had not listened to for so long,” she said.